Due to the potential hazards involved in working at great heights, cherry pickers aren’t normally available for self drive hire. Instead, you’ll be hiring the equipment and a crew of trained professionals. These contractors maintain high levels of safety standards, and will also hold the right qualifications allowing them to work at height. Most services will offer one or two man teams which should be ideal for small domestic jobs such as clearing out the guttering or repairing damaged roofs. The teams can be larger if necessary though there will be additional fees for each extra crew member. For many standard domestic jobs, like painting and decorating, trimming back high hedging or conducting work on TV aerials, companies are likely to have a standard rate. You simply hire the cherry picker, pay for the crew, and they’ll come out and complete the job. In some instances, you’ll even find fixed prices for this. Alternatively, firms may offer an hourly rate. On average, you can hire a one man crew for £25 per hour, and a two man crew for £45 per hour. It’s essential you check there’s no minimum cost, however, as some firms will charge a larger fee to include travel times between the depot and worksite. This is particularly true if you’re quite a distance from the nearest service. 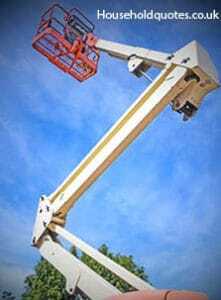 If you’re a substantial distance from your nearest cherry picker depot, you may have to pay additional fees for travel. This is because, though you’re technically not actually using the equipment whilst it’s en-route, no other client can use it either. A minimum period of three hours, for example, may be charged to include outward and return journeys as well as the hour of work required. It’s important, therefore, that you try and use your nearest depot to keep costs down. Even if their hourly rates aren’t the cheapest, they might be the most affordable once the fees of other companies are added. When you’re first looking for quotes, use a site like Quotatis to discover the best options in your local area. You’ll often be able to gain valuable advice and insights too, allowing you to make the most economical decision. One of the benefits of hiring cherry pickers is that you don’t normally need to pay a deposit, and if one is required, it’s not usually very much. This is because you’re effectively hiring a service rather than renting a piece of equipment. For example, if you hire a van, a deposit is required in case you damage the vehicle, or don’t return it at all. But because you’re paying for a work crew as well as the cherry picker, there’s negligible risk to any supplier. The size of vehicle that your cherry picker comes with will largely depend on the job you’re having done. For most domestic users, a cherry picker with a 12m reach attached to a transit van is sufficient. This should provide adequate access to the roofs of a standard house. Higher buildings will require larger vehicles and cherry pickers. A boom and hydraulic system can be utilised to achieve greater height and provide increased access for a variety of projects. Jobs requiring these bigger pieces of equipment after often more complex, and many companies rent cherry pickers out on a daily or weekly rate instead of by the hour. On average, a 40ft picker will cost between £80 and £100 for a day, and between £200 and £300 for a week. Overall, hiring a cherry picker offers an economical choice when it comes to many common chores and projects. The cost of installing scaffolding at home to decorate a property, for example, is likely to cost a lot more than renting a cherry picker with a painting crew. And, though you can’t hire a picker and do the work yourself to save money, you will have peace of mind the job’s been done properly and with the right safety procedures.